This badge was issued to Marcin Hanasiewicz on 09 Nov 2018. 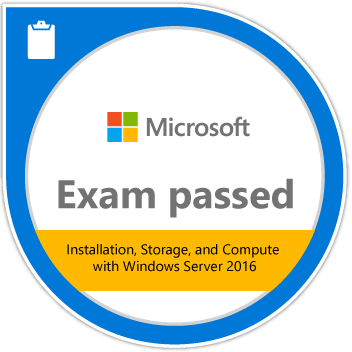 Passing this exam validates a candidate’s ability on general installation tasks and considerations and the installation and configuration of Nano Server, in addition to the creation and management of images for deployment. It also covers local and server storage solutions, Hyper-V and containers, and maintenance and monitoring of servers in physical and compute environments.